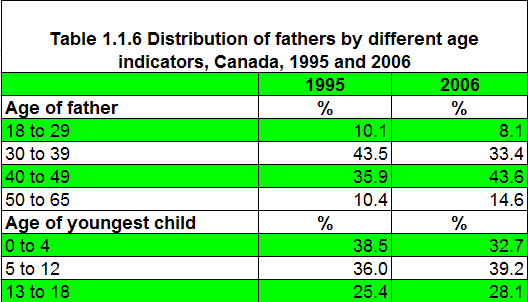 Source: CICH table created using data adapted from Beaupré P, Dryburgh H and Wendt M. Making Fathers Count. Canadian Social Trends 11-008-X No. 90. 2010002. Statistics Canada. General Social Survey. 1995 and 2006. http://www.statcan.gc.ca/pub/11-008-x/2010002/article/11165-eng.htm -accessed March 19, 2017. The percentage of fathers* in Canada who have children 0 to 4 years of age declined between 1995 and 2006. In 1995 39% of fathers had a child under 5 – declining to 33% in 2006. *Fathers were defined as between age 18 to 65 at the time of the survey who were living with or reported having fathered, adopted or reared a child who was 18 years of age or under at the time of the survey.